This Panda lunch box was picked by Nikolai and we also have the matching fork and some other Panda accessories to go with it. I used our super easy CuteZCute cutter for this simple snack. Happy Easter to all who are celebrating and have a wonderful weekend everyone! 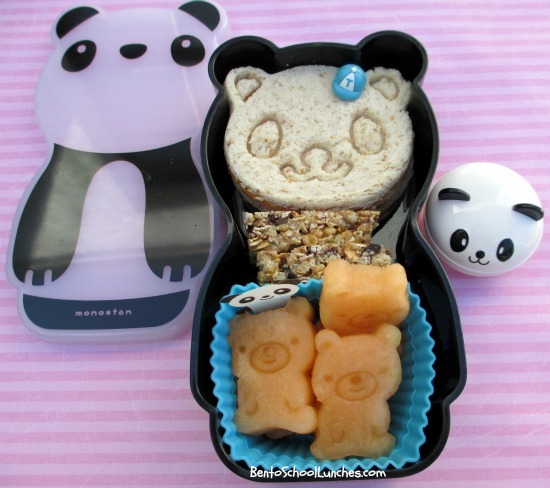 Panda shaped sandwiches (stacked) using our CuteZCute cutter and stamp. Bear shaped cantaloupe using a small bear cutter and stamp with a Panda baran sheet on a square silicone cup. Edamame in small Panda container and also a Panda fork that is not in photo. Here are the supplies that I used to make and pack this snack. SO cute, Rina!! :) Love the cantaloupe! So cute!! I've this box too, but been hogging it, yet to use, lol. Thanks so much Ming! Lol, I'll be hogging it too but Nikolai was impatient to use it, it's just too cute of a box! :) I am eying the double tiered one, it is very cute too.